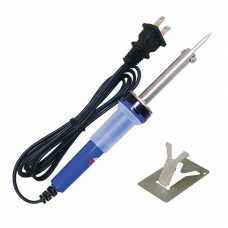 The SR1N is a Basic 25 W Soldering Iron that is suitable for assembling electronic kits and projects. This low cost soldering iron is great for students and beginners. It has a 25W heating element and a pencil tip. A small stand is included. Uses the SR1NT replacement soldering iron tip.